Symmetries (2004) is one of my earlier interactive works focusing on integration of an independent interactive algorithm run by a computer and a live performer, namely violin and a hyperinstrument (consisting of a computer and a custom controller). The primary focus was on putting greater responsibility onto the computer by delegating the overall structure to a Markov chain algorithm (implemented in Pure Data) that would decide the course of the piece. Performer was issued a score split into snippets (akin to Mozart’s Musikalisches Würfelspiel, or musical dice game) and was given in real-time next part to play, as determined by the computer’s arguably sentient algorithm. The Markov chain was algorithm complemented with a starting amount of a virtual “energy pool” that was depleted every time the overall harmonic motion moved away from tonic and towards disonance, and then recharged when it returned towards tonic/consonance. The farther the leap, the greater the amount of energy was to be expended and/or replenished. To increase the overall harmonic motion towards musical climax, the system was constantly fed additional energy that pushed the harmonic and melodic motion further away from consonance, eventually reaching climax, followed by a stepwise descent back towards tonic and consonance and ending one step shy of the final tonic. 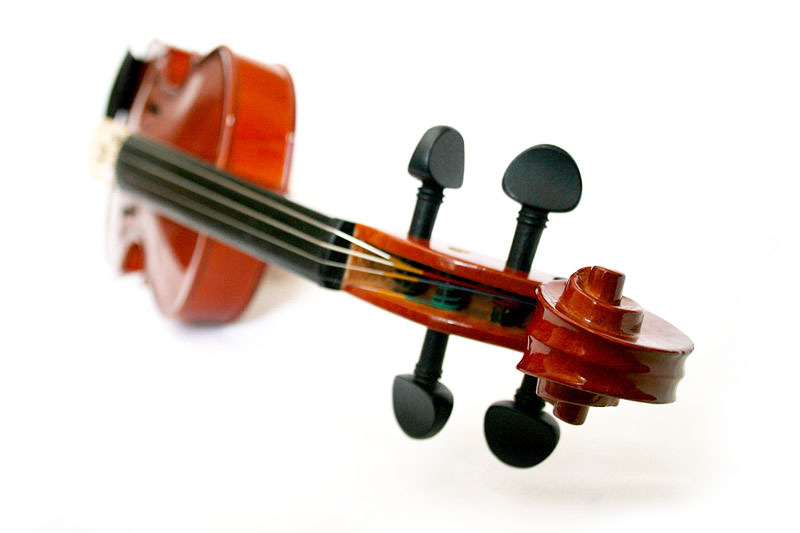 The ensuing aural output was shared among violin soloist whose acoustic sound was also processed in real-time by the computer and further shaped in real-time by the second performer using the aforesaid hyperinstrument. For this purpose, I recorded and produced a soundfont (a sample sound bank) of a violin playing every note of the Western traditional scale using con sordino technique. This was also one of my earliest efforts at exploring 8-channel diffusion, projecting computer and processed violin parts across two dynamically dislocating axes. As a result, computer was responsible for chordal structures, real-time audio processing, as well as the overall structure. Given the entire ecosystem was driven by a seeded random number generator, allowing for repeat performances with identical structure, as well as profoundly different experiences both for performers and listeners. Symmetries was originally commissioned by Anna Zielinska who also premiered the work. The iteration performed at the 2006 International Computer Music Conference at Tulane University, New Orleans, also engaged Newcomb dance company who provided choreography for the piece. Special thanks to Rena Ishii for volunteering her time and talent to record the con sordino samples for the soundfont (downloadable via link below). Click below to hear work’s premiere performed by Daniel Mason (Lexington University). LAC3 conference in Karlsruhe, Germany, April 2005 (premiere). Sonic Explorations, Cincinnati, Ohio, April 2005. 0th Sound contemporary multimedia art concert (Dissertation Concert), St. Pius X, Edgewood, Kentucky, May 2005. Music05 festival, Cincinnati, Ohio, June 2005. Accent05 festival faculty concert, Cincinnati, Ohio, June 2005. Resonance FM radio station, London, United Kingdom, August 2005. ICMC2006 conference (dance choreography by Tulane University’s Newcomb Dance Company) in New Orleans, Louisiana, November 2006.